As developers, we sometimes love to conveniently create easy-to-read documentation so as to ease the stress that accompanies styling at the beginning. For this, you need an easy tool such as the Markdown editor. This enables you to create a H1 ( for example) by simply adding a # before the header. Marked: a low-level markdown compiler for parsing markdown without caching or blocking for long periods of time. Executing the command above will bring up a couple of questions, you can accept the default and proceed. 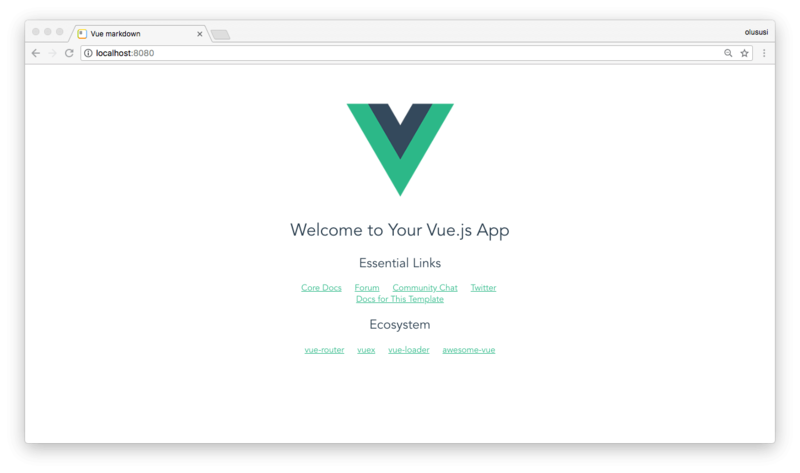 Once the installation process is completed, you will now have a new project named vue-markdown installed in your project directory. Head over to Pusher and sign up for a free account, if you don’t already have one. Log in to create a new application by clicking on the Channels apps on the sidebar. Obtain your application credentials as we will need to use them later in this post. Pusher allows you communicate between different parts of your application in realtime. It can be a notification you wish to show your users or the price of a product which people are bidding on currently. Whatever it is that needs constant updating, you can (and maybe should) use pusher for it. By default, Pusher allows you bind to events on the client-side (listen to events on your browser, app, etc) and then trigger events on the server-side (send broadcasts to all listeners from the server). However, pusher has this really cool super amazing feature called private channels that allows you trigger events from the client side. You have to turn it on and perform a few actions to use it. You must authenticate the Pusher subscription before you can trigger events on the client-side. So, from your Pusher app dashboard, go to App settings and enable client events before you continue with this guide. Now you are ready. You can read more about private channels. Ensure that you replace YOUR_APP_ID, YOUR_APP_KEY, YOUR_APP_SECRET and CLUSTER placeholders with the appropriate credentials. The main objective of this application is to be able to process and convert a raw markdown to HTML in realtime from all browsers, to effectively achieve this, we’ll use Express to set up a simple server and use Pusher to broadcast the converted markdown to all the client on a specific channel. First, we basically loaded all the necessary middlewares for the Express server and configured Pusher using the credentials we added to our environment variables earlier. 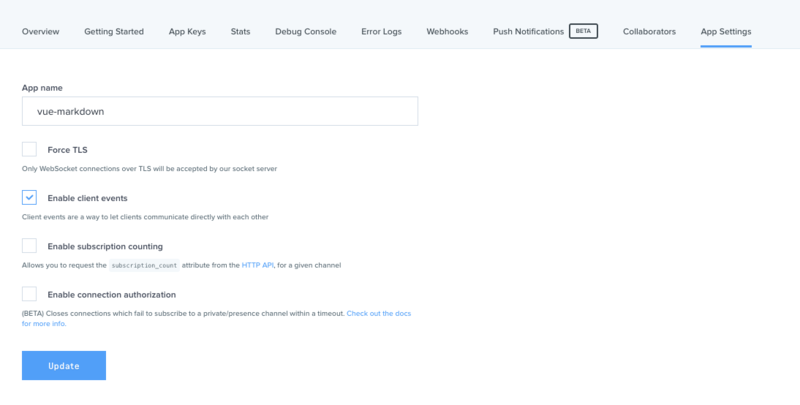 Our client application will need to make an API call to a specified endpoint in order to authenticate our pusher connection and ensure we can run a private channel on the frontend. Pusher has an authenticate() function that does that for us. Here, within the template section of the component above, we created two separate columns: a textarea where the raw markdown will be written and a second column to preview the compiled markdown in realtime. Furthermore, we proceeded to added a little bit of styling to the application. We want to send updates to our document immediately the user makes them. This is the whole essence of adding realtime functionality to begin with. With private channels, we can skip the entire step of sending the update to the server and then triggering an event from the server. We can do all of that from the client now. In the created method, we have defined the Pusher application, subscribed to a private channel and bound the channel to the an event. Now, we are ready to listen to any data exchange that will happen across that channel. Do ensure that you replace the YOUR_APP_KEY and CLUSTER with the appropriate credential. Also replace the authEndpoint with the endpoint you defined for your application. The computed data attribute compiledMarkdown will always be updated as the content of markdown changes. This is good for us so we can see changes immediately. We included the CDN file for bootstrap, added a navigation bar and also included the script file for Pusher. 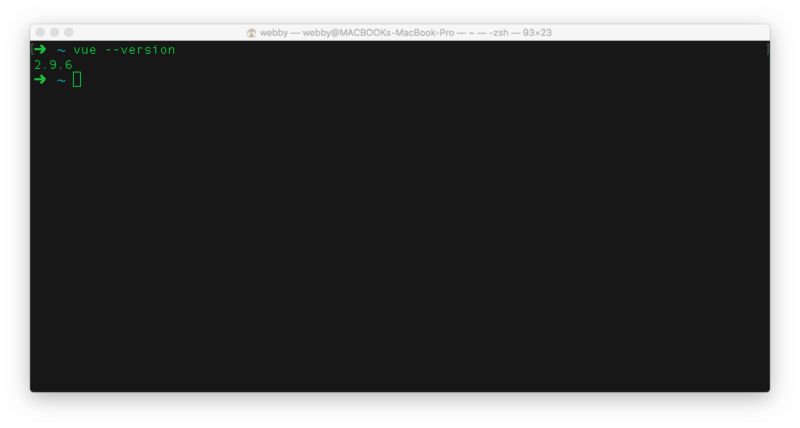 Restart the application by running npm start from the terminal and don’t forget to also start the server by opening another terminal within your project folder with node server. In this tutorial, you have learned how to conveniently build a simple markdown editor application using Vue and Pusher to enhance the realtime functionality. I hope you found this helpful. You can find the source code for the demo here on GitHub.